PanARMENIAN.Net - Melbourne scientists have revealed a new type of cancer treatment that doesn't have the same harmful side-effects caused by conventional therapies, Newshub says. 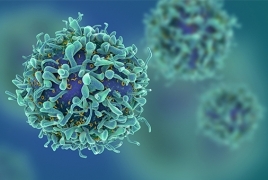 The new class of drug has been hailed as an exciting alternative to treat cancer, and has already shown "great promise" in halting cancer progression of blood and liver cancers, journal Nature reports. One of the lead researchers, Associate Professor Tim Thomas from the Walter and Eliza Hall Institute, said the new class of drug was the first to target KAT6A and KAT6B proteins. Both are known to play an important role in driving cancer. "Early on, we discovered that genetically depleting KAT6A quadrupled the life expectancy in animal models of blood cancers called lymphoma. Armed with the knowledge that KAT6A is an important driver of cancer, we began to look for ways of inhibiting the protein to treat cancer," Associate Prof Thomas said. "This new class of anti-cancer drugs was effective in preventing cancer progression in our preclinical cancer models. We are extremely excited about the potential that they hold as an entirely new weapon for fighting cancer. "The compound was well tolerated in our preclinical models and is very potent against tumour cells, while appearing not to adversely affect healthy cells." That's the critical difference between the new class of drugs and standard therapies such as chemotherapy and radiotherapy: patients won't suffer from common side-effects such as hair loss and nausea. "Rather than causing potentially dangerous DNA damage, as chemotherapy and radiotherapy do, this new class of anti-cancer drugs simply puts cancer cells into a permanent sleep," said another research lead Associate Professor Anne Voss. "This new class of compounds stops cancer cells dividing by switching off their ability to 'trigger' the start of the cell cycle," she said.